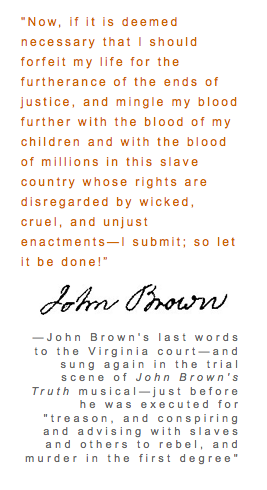 John Brown’s Truth—a multi-genre, musically-improvised musical with an extraordinary cast of singers and instrumentalists, dancers and spoken-word artists, tells the story of abolitionist John Brown’s anti-slavery raid on Virginia 150 years ago. a multi-genre, musically-improvised musical by William Crossman with an extraordinary cast of classical singers and instrumentalists, dancers and spoken-word artists, using afro-caribbean/jazz/european-classical/spoken-word/dance to tell the story of abolitionist John Brown’s anti-slavery raid on Virginia 150 years ago. $15. General, $10. Students with I.D. Wheelchair accessible. See larger images of the posters and complete ordering info.